I recently had the pleasure of working side by side with Dan Cohn: CEO of B.R. Cohn Winery based out of Sonoma Valley California. 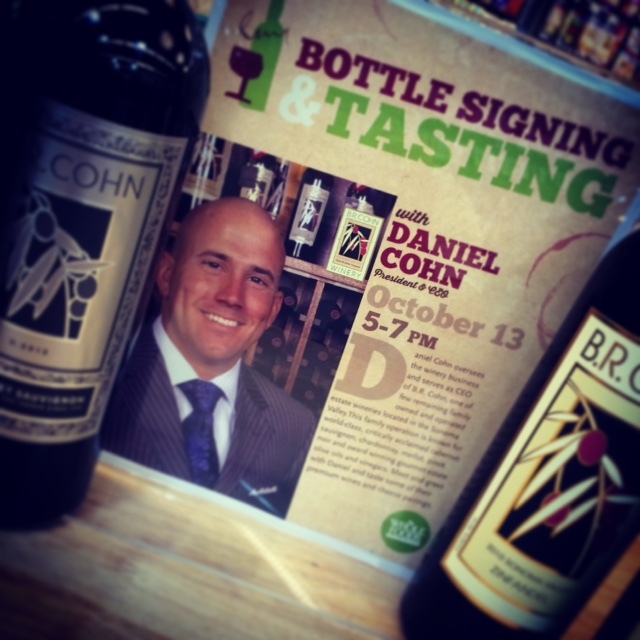 Dan spent a few hours sharing the wines of B.R. Cohn with the Whole Foods Market North Miami Specialty team and all guests lucky or smart enough to stop in and visit. Our department became quite the happening spot [admittedly more than usual] thanks to his great outgoing personality. Entertaining groups or one on one Dan made sure you found “your new favorite wine” and he had the product to back it up. After selling wine grapes for many years to August Sebastiani and Gundlach Bundschu and seeing the numerous awards the wines with fruit sourced from the Olive Hill Estate were receiving, Bruce took the advice of good friend and mentor Charlie Wagner from Caymus Winery and began producing his own wines from the Olive Hill Estate in 1984. 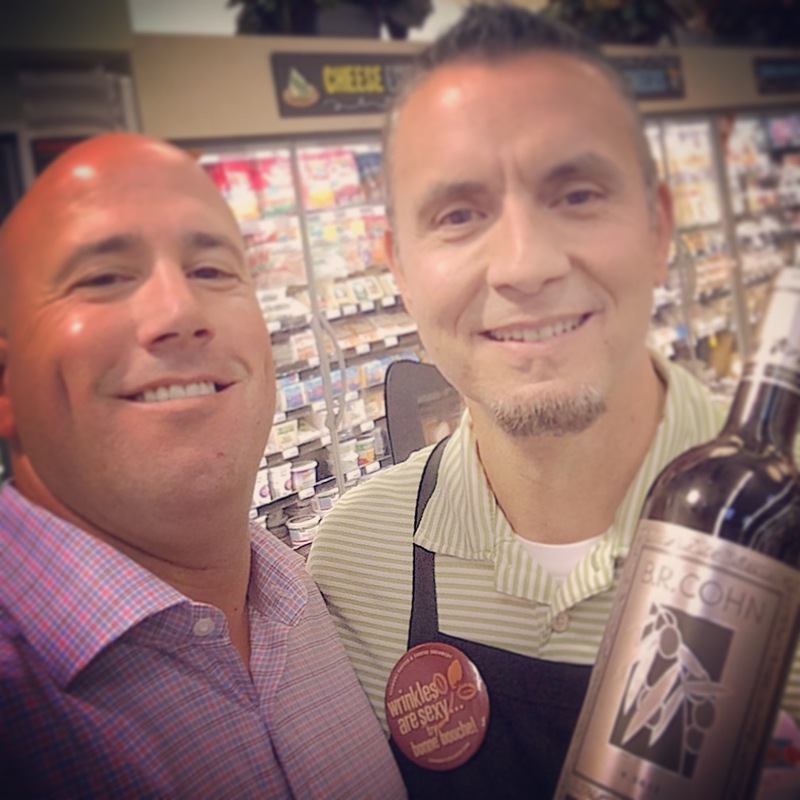 Charlie bestowed the greatest honor upon the winery, permitting the use of Caymus’ trademarked “Special Selection” on the best lots from B.R. Cohn Olive Hill Estate. Always looking for ways to give back to his community, Bruce brought his two life passions together in 1987 by inaugurating the B.R. Cohn Charity Fall Music Festival. Every year, wine lovers and music fans alike flock to the Olive Hill Estate to revel in the beautiful wine country while enjoying top music acts. The proceeds from the concert benefit many local children and veteran charities as well larger national charity organizations. 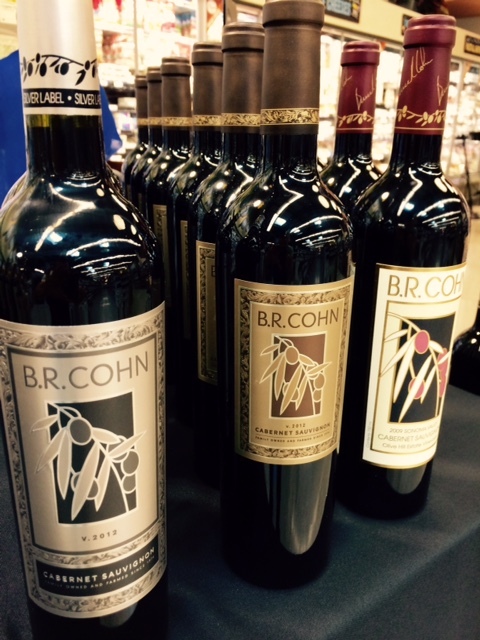 I must admit that prior to our in-store event I had not had the pleasure of tasting these wines. Luckily for me and many who partook what better way to get introduced. We featured five wines and each one charmed. This Chardonnay is made from grapes grown at the Sangiacomo Vineyard in the Carneros Region of the southern Sonoma Valley. This wine is rich and concentrated with aromas of tropical fruit, pear, apricot, and lemon meringue surrounded by a bouquet of toasty oak, vanilla, caramel, and hazelnut. A blend of select hillside vineyards in Sonoma, Mendocino, Lake Counties and our own Olive Hill Estate Vineyard. Individual vineyard lots are fermented and aged separately. Complex and full, rich aromas of plum, cassis and black cherry are accompanied by a bouquet of the finest French oak, cedar, cola, anise, vanilla, and nutmeg. 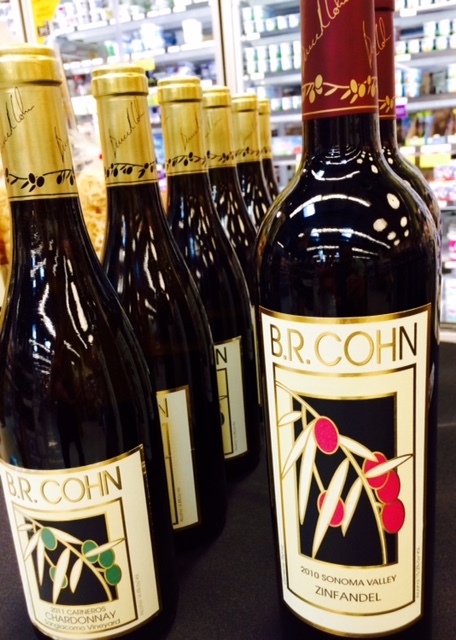 On the palate, a big rich Cabernet with luscious flavors of dried berry and cherry, ample tannin, and a long finish. 4 Stars – Restaurant Wine “The Gold Label bottling is intensely flavored, full bodies, and lightly tannic, with firm acidity, and pronounced eucalyptus mint character (with overtones of black cherry, cassis, red licorice, spicy oak, and cooked meat). Very long finish. Can be aged further. Aged in French oak barrels. A unique blend of only our best lots from Napa and Sonoma, coupled with select vineyard blocks from the B.R. Cohn Olive Hill Estate Vineyard. Full-bodied rich Cabernet Sauvignon with aromas and flavors of currant, plum, black cherry wrapped in oaky spice and cedar. This is a big, luscious Cabernet, balanced with firm tannin, ample acidity, and a long warm finish. ensure the character of each part of the Olive Hill Estate Vineyard. warm with a long smooth berry flavored finish. As I mentioned to Dan that night I was truly impressed with all five wines we tasted. Across the board I would recommend each one of them to our customers. My favorites? If I had to narrow it down the Silver Label Cabernet produced with grapes from three vineyards and the single vineyard Olive Hill Estate Cabernet Sauvignon were my highlights and somehow ended up in my shopping basket! We had a great response to this event. 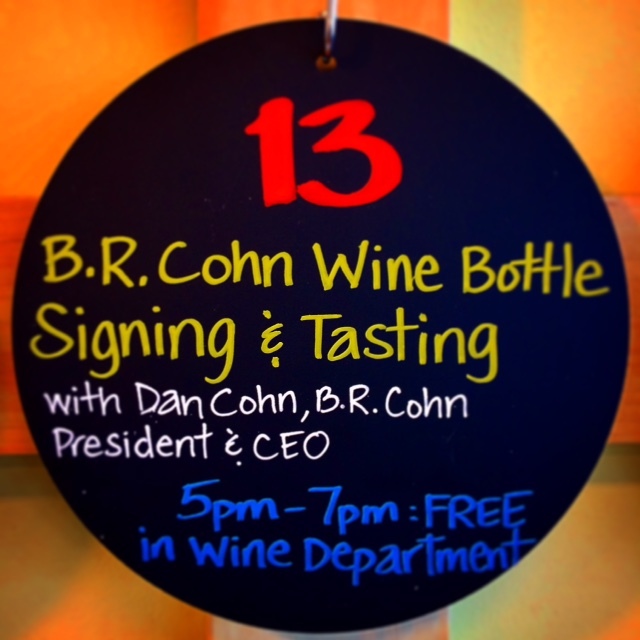 Dan Cohn, who by the way has a Rock’n signature for bottle signings, kept us all entertained with his wine stories. More importantly customers continue to come back for more of his wine. ¡SALUD!